CAN: Aluminum cans, plastic products (rated #1 to #3 – bottles, jugs, etc. ), clean pizza boxes, garden plastics, flattened cardboard boxes, empty containers, glass and paper products such as newspapers, magazines, phone books, etc. CANNOT: Plastic bags, foam or Styrofoam containers, wire hangers, windows, mirrors, ceramic or Pyrex dishes, organic or food waste, electronics, paint, pesticides, cleaners, waxed cardboard, needles or syringes, scrap metal or hazardous waste. * Rinse all aluminum, glass and plastic recyclables before placing them in your cart. * It is not necessary to remove labels from metal, glass, plastic jugs, cans and/or jars. 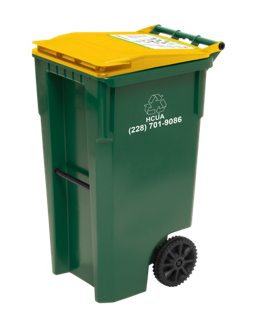 * Recyclables should be put loosely in your HCUA provided cart. Do not bag them. * Buy products made from recycled products and products made from glass, metal and aluminum, as these products can be readily recycled. 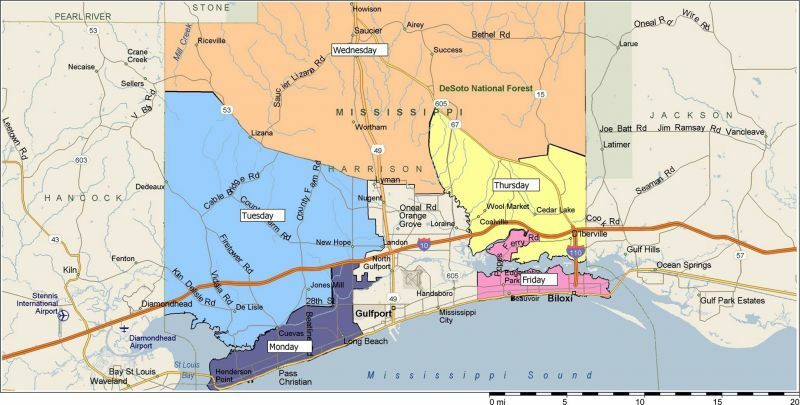 Have a question about our recycling program and community outreach efforts, please call (228) 868-8752.